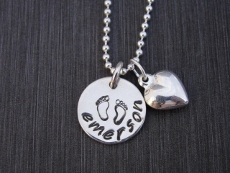 A sterling silver disc is stamped with our footprints stamp in the center and the name around the bottom. The disc can be stamped with block, script, and lowercase font. 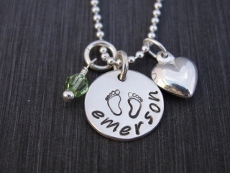 The discs are hung on sterling silver ball chains, which come in 16”, 18” or 20” lengths.